Like an A-Z of videogame history! I’ve been wanting to write an article about The ISO Zone for ages. It’s a website that rekindled my love for all things retro, and has been a great help to me over the years. Take a look for yourselves right here. Think of TiZ as the largest repository of old computer games on the internet, because it probably is. This site has titles for every retro system, from PS2 to Memotech MTX512 (I don’t even know what that is!) and there are thousands of games to download, all for free. You can install games on your PC, burn them to disks for use on consoles, or use them on emulators/flash cartridges. The website has pretty much any title you can think of. If by chance a game you want is actually missing from TiZ’s library, you are able to request it and 9 times out of 10 somebody will upload it just for you! The download speeds are so-so, I’ve certainly experienced faster. But the massive amount of choice and the quality of the uploads is worth it. All games have descriptions before you hit the download button, and most will give helpful information on how to run them once you have them. It’s not just games either. A wide range of applications are available too. Whether you want to burn a game to CD or FTP files to your Xbox (a little advanced for some people) you can get everything you need for the job here. The site is retro ONLY and has a strict set of rules as to what can be uploaded. You won’t find Wii, PS3 games, or anything still being actively sold. Copies of Steam games aren’t allowed either. Some people may argue about the legality of such a site, but the aim here is to preserve the life of these old games, and allow people to enjoy them on their original formats. I have gone on record a couple of times recently saying how expensive some of the older titles are these days, but with TiZ you can experience these games…. without the extortionate Ebay prices. You can also play titles you wouldn’t have come into contact with before, such as obscure PC titles and Japanese-only console games. It’s really quite special! TiZ has a well-established userbase, spanning the globe. Users who register on the forums are a friendly bunch and between us we have a vast knowledge of consoles, computers, industry history and Spiderman memes. You might be struggling to load a Dreamcast game, want to mod your PS2, or just bored and fancy a laugh…. there’s always someone on the other side of the monitor who will respond. New members are welcomed into the site on a daily basis, and despite the occasional drama I’d say we’re one big family! Yes I used the word “we”. I’m a proud member of the community on TiZ, and have been for over 4 years. I’ve helped plenty of people, uploaded some games myself (mostly for the mega CD) and received help from members on a number of different subjects. Post and Uploader names are always listed, so keep an eye out for me! Of course, I’m available to chat anytime! There’s a small amount of buying and selling going on at TiZ too. 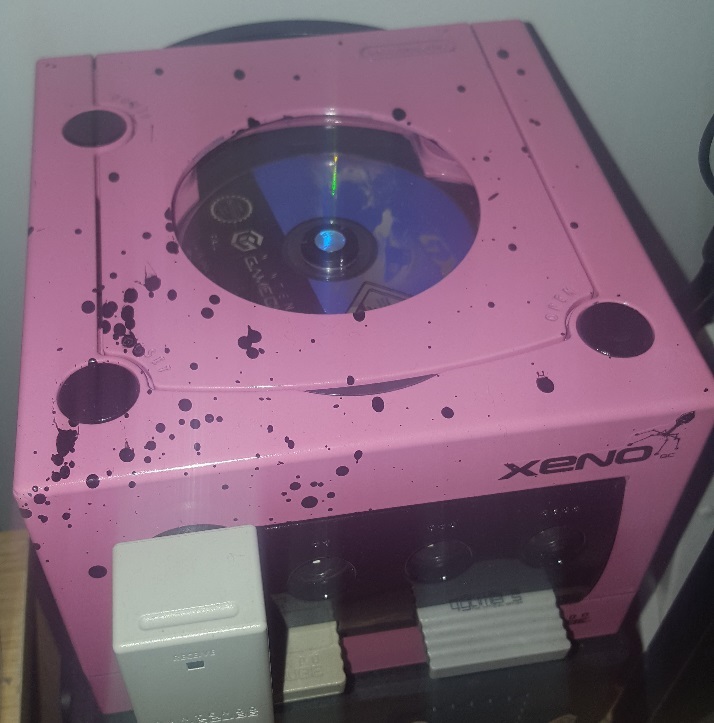 I’ve been involved in a few deals, but special mention must go to Biggsy who custom painted my Gamecube! I wanted to introduce you all to this wonderful site before I cover subjects like console modding and emulation. (Which will happen, somewhere down the road!) This is a great resource when it comes to old-school gaming and I still consider it my second home online. If you’re thinking about re-discovering some old favourites, or want some help/support with your old machines, get stuck into theisozone.com. Sign up, join in the fun on the forums, and re-live the glory days! Posted on August 4, 2016 August 7, 2016 by itsonlyleggyPosted in Feature, RetroTagged Link, Resource, Retro, TiZ, Website.